Cut brinjals into long stripes. Take oil and saute it till it is crispy. Add salt, red chilly powder, turmeric powder and mix it well. Take oil in a pan. Add cumin seeds, garlic paste, salt, red chilly powder and mix it well. Take it down from the gas stove and mix curd into it. 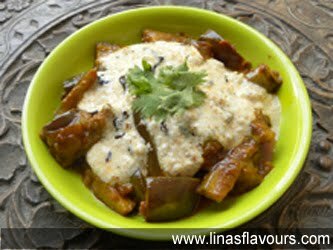 Pour this tempered curd on crispy brinjals.